On warm weekend evenings, rooftops along many Chicago alleyways wake to a Ravinia-like second life. Wine flows, lights glow, and music and laughter mingle with the rustle of garden leaves and grasses. The tantalizing smell of the grill wafts over all. Lit up like hot spots on a party circuit board, these private urban getaways transform what used to be flat expanses of wasted space into something useful and magical. “We wanted to create an outdoor space for both entertaining and lounging,” said Laura Keidan Martin of Lakeview, “But given the constraints of a city lot, the only direction to go was up.” Two years later with the help of Paul Florian of Chicago-based Florian Architects, the Martin family has a multifunctional space that’s good for lounging with the Sunday paper, drinking wine with a few close friends and entertaining large groups of people. “We’ve had parties with as many as 50 people on the roof and patio below, and they haven’t felt crowded.” said Martin. “Living in the city brings a wealth of cultural and social options for our family, but didn’t allow the backyard of our dreams,” agreed Lincoln Park homeowners Cecil Booth and Danny Sharp. To create that missing oasis, their family opted for three separate rooftop gardens by Denise Rosenbloom, of Botanical Concepts Chicago. “We really consider them outdoor rooms – places to relax and enjoy a break from indoor living – which is especially precious in Chicago where our good-weather season is so short,” said Booth. Each one of their roof spaces has a different character. At the front of the house, views across the tree-lined street to the park beyond are possible from chaise lounges arranged among pots of purple-leaved Royal Frost birch trees, where Sharp enjoys the occasional cigar with friends. At the back of the house, Booth’s penthouse-level home office opens out to a deck with papyrus-planted water gardens and a tall outdoor fireplace ringed with easy chairs. Visible below this, a third roof deck, over the garage, includes tall plantings of mature trees, a pergola with a lazy-turning ceiling fan, and plump-cushioned sectional sofas. “We’ve even added creature comforts such as a wireless Internet and music system and a lamp,” Booth said. While some of Chicago’s more elaborate residential rooftop retreats are on single-family dwellings, new condo rooftops have them too. “Rooftop retreats are something people expect. It’s become almost a necessity to include them,” said Bob Horner, co-principal of Evanston-based Winthrop Properties, developer of The Winthrop Club, a new 96-unit, one- to three-bedroom condo development in Evanston. Winthrop Club has a large sun deck and pool with southern exposure overlooking green roofs planted with deciduous trees, shrubs, native grasses and perennials. Private rooftop decks are an amenity at Lexington Square, a new rowhouse development in Bridgeport. At 10 E. Delaware on Chicago’s Gold Coast, there’s a large rooftop-level pool, sundeck and visible (not walkable) green-roof garden for owners of one-, two-, and three-bedroom condos. And decks, patio dining and dog runs are included on the green roof at Chicago’s Opera Lofts, at the edge of the South Loop. To meet the demands of homeowners who want to better utilize and enhance their rooftop surfaces and patios, Mike Maschmeyer and Darren Flynn recently opened Chicago Roof Deck and Garden showroom in Chicago’s Lakeview neighborhood. “Creating a beautiful outdoor space improves their quality of life and positively contributes to increased property resale value,” said landscape designer Maschmeyer. In years past, transforming rooftops into retreats – especially with older buildings and garages, came with the need to shore roofs up, making them strong enough to support big weight loads. But today, builders of new construction include rooftop retreats in the planning, ensuring that roofs are sturdy enough. Since the Lincoln Park porch collapse tragedy of the late 1990s, Petersen and other builders have chosen to “overbuild” with reinforced truss systems. This is a good thing, engineering-wise, as rooftop retreats are not just flat space. Trusses have to be engineered to support hot tubs, spas, massive tree and shrubbery planters, and pergolas. “Plants need water, barbecues need gas, and lights need electricity so all this needs to be thought of too, during the planning and building stages,” Petersen said. 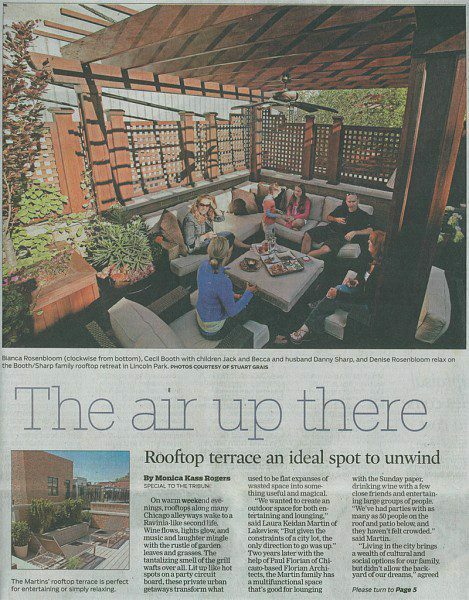 Figuring out what ratio of plants, patio space and furnishings will make the rooftop most pleasant is a balancing act. “You want it to be multifunctional, but you don’t want to put so much up there that it becomes cluttered,” said Rosenbloom. There’s also the need to provide shade and privacy without making the rooftop feel claustrophobic and confined. “Lattices can make you feel like you’re in a playpen or cage,” said Rosenbloom. Avoiding this, both she and Florian prefer to screen out alley views with trees and plants. At the Martin residence, for example, steps lead down from the grill deck at the back door to a dining “bridge” with custom-designed table and chairs that spans the landscaped garden. From there, broad steps leading up to the deck include extensive multilevel plantings that cascade from the roof to the ground level. “This takes into account the views from the kitchen and family room,” Florian explained. Conversely, views toward the house from the garage rooftop include small, colorful plantings on two different-level bedroom decks. Best benefits all around? “The chance to relax, entertain and enjoy good weather and a beautiful garden in Chicago without leaving home,” said Martin.